The type-2 diabetes control is in your hands and literally, at your fingertips. Test, analyze, modify, and test again until reaching your target BS. You should check your fasting that is before eating anything to check the liver. Moreover, two hours after start eating your meal to check how well your body responding to food. Keep a written log for what you eat and your BS tests result. Your meter can keep the reading in its memory. These readings are no meaning unless you relate with what food influencing how much BS. Write down what food, how much and match it to the BS respond it makes. This helps you to find enemy foods (makes higher BS spikes) and replacing it with friendly foods (makes lowest BS spikes). Next, find out when your BS peak spike happens after eating. Start testing at 1, 1.5, 2, and 3-hours after eating (do these for all three meals). Learn at which time your highest spike occurs. This is the time your will do postprandial testing in the future. There is a peck at 30 minutes after eating that is no importance because studies confirm that will not increase diabetes complications. My A1C is below 6.5%, why should I SMBG? Most type-2 diabetes (even their healthcare providers) on seeing their A1C of less than 6.5% might be a normal blood sugar number. Thus, they may think why should spend money, time and effort of BS testing. However, the truth is the A1C is the average glucose of 24 hours a day, for about three months past. An average may contain both highs and lows; it is common to have an A1C of less than 6.5% with blood sugar highs at 200s and lows at 50s. You may shock to hear still this may be the truth. Why, when, how and what is blood sugar testing? 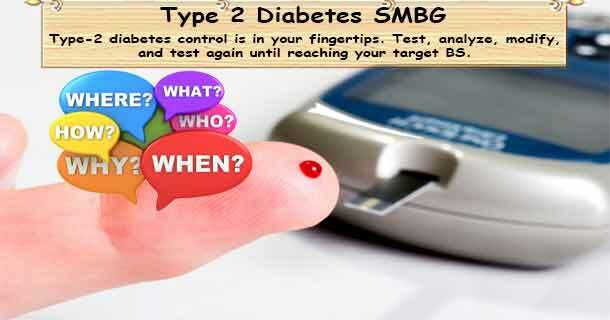 Blood sugar testing is important to manage your diabetes and stop its complications. For type-2 diabetes, BS testing is not emphasized, thus they are more likely to get early diabetes complications than type-1 diabetes. A study shows people with type1 diabetes develop the diabetes complications after 15 years, whereas people with type2 diabetes may develop diabetes complications after 10 years. Why you need to test BS? Blood sugar testing or self-monitoring blood glucose can help you how well your diabetes treatment is going on, learn how your diet and exercise influencing your blood sugar levels, discover how an illness & stress can disturb your BS, know how your medication maintains your BS, and identifies and prevents hyper & hypoglycemia. Why I should take both fasting and postprandial blood sugar? When type2 diabetics have a raised fasting blood sugar, does not mean anything about the diet for the day or night before, why? Because the carbohydrate is the nutrient in your food that takes around five hours (maximum) to raise your blood-sugar level. After that, the sugar level in blood starts dropping, your brain signaling the pancreas to release the glucagon hormone. This hormone will signal the liver to convert stored glycogen to glucose and releases into the blood stream. Thus, the blood-sugar level after five hours since you last had food is the indication of your liver’s glucose mechanism. The fasting blood sugar only indicates your liver’s glucose mechanism and does not show anything about your body’s response to the food you ate. To know how your body handles the food (particularly carbohydrate); you should test your blood sugar after one or two hours after start taking your meal. After ingesting food, your blood sugar rises for about two hours and then returns to normal within next two hours. Thus, you should check your fasting that is before eating anything and two hours after start eating your meal. When do you do BS testing? How long after a meal, the blood-glucose is rising to its peak. How fast it is returning to normal. You will see how carb foods such as bread, potato, pasta, etc. raise your BS reading. How certain low carb foods (such as food rich in fat, protein and whole grains) is producing the least rise in your BS. How often BS tests you, need to do? Leading diabetes institutions does not recommend SMBG for type2 diabetes, if you are on lifestyle diabetes control or on medications. Only those on insulin treatment can test twice daily. However; diabetes type 2 requires to test their blood sugar two or more times, when newly diagnosed, changing medication, ingesting new-food, unstable BS, high blood sugar levels (fasting >130mg/dl, postprandial >180mg/dl), acute illness, pregnancy, on insulin therapy, acute illness, hypoglycemia risk, and if job warrants (such as pilots, critical jobs, etc.). If your A1C is within your target range (A1C of less than 7%), you do A1C test twice a year. If it is not in your target range, you do A1C test four times a year. If you are not affording to test BS frequently, (four times a day, testing roughly requires $120 a month for test strips), then you can do block testing, means testing four or more times a day only one day per week. Record what you eat, how active you are, what & when you have medication, quality of sleep, stress level. Etc. If your type2 diabetes is in control, you do not need to test more frequently and could test once a week. If your diabetes control is not as expected and try improving it, then you should test more often as needed. Reasons for elevated fasting blood sugar: inadequate sleep, any form of pain, illness or infection, skipping your regular exercise, missed your medication previous night, too much of stress and/or right before a menstrual period. Reasons for elevated postprandial blood sugar: eat too much, ingesting wrong food (more carbs or sugar), forget to take medication (or need medication change), any form of pain, illness or infection, before a menstrual period, taking steroids (such as prednisone/cortisone), skipping exercise earlier in the day, and/or stressed out. Blood sugar under 70mg/dL is considering as hypoglycemia and needs treatment by ingesting a quick source of a carb like three to four glucose tabs, half cup juice, half regular soda (six ounces), eight ounces nonfat milk, etc. Waited for ten minutes, retest and makes sure it is over 80. If BS is remained below 80, then repeat the treatment and retest in 15 minutes until BS rises over 80. Type 2 diabetes should not tighten their control, if they are frequently experiencing hypoglycemia or occasionally non-symptomatic hypoglycemia.